The Similan Islands is Thailand’s best dive destination and is often referred to as being among the world’s top ten dive destinations. The Similan Islands National Marine Park is made up of nine granite boulder islands that lie in a north to south line about 100 km north west of Phuket. The marine park is open from mid October to mid May each year and during those months liveaboard and day trip boats bring snorkelers and divers to experience the crystal clear water and exquisite marine life. The Similans is officially closed from mid May to mid October when big waves can make the crossing from Phuket or Khao Lak hazardous. The ideal time of year to visit is February to April when the sea is glass flat and most pelagics are sighted. This is also the most humid time of year so the most pleasant place to be is on a boat where sea breezes take easy the heat. One of the interesting aspects of diving the Similan islands is the difference between diving the east sides of the islands and diving the west sides. The variety makes a Similan Islands liveaboard trip to this area very popular because each dive is different. The eastern sides feature gently sloping coral reefs with gardens of hard and soft corals starting shallow and sloping down to the white sandy bottom at 30-40m. Coral bommies that are completely covered with soft corals, sponges and sea fans rise from the sea bed, some big enough to consume a whole dive time or a full camera memory stick. These east side dive sites are relatively easy dives with gentle currents to drift along with and very clear water. Schools of tropical fish are everywhere and the fish in the Similan islands are that bit bigger than in other Thailand dive sites. They also seem less afraid of divers and won’t swim away quite as quickly when you point your camera lens in their direction. 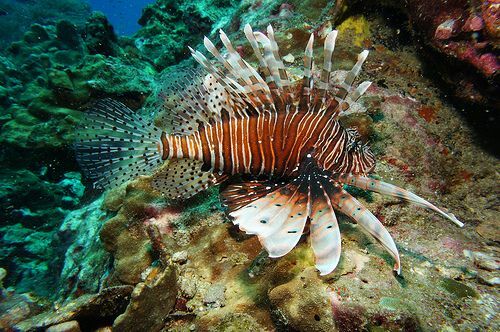 West coast Similan dive sites as well as the north and south tips of the islands offer a different type of diving which is more challenging and, at certain times of the month when currents are strong, may not be suitable for inexperienced divers. Huge granite boulders lie heaped on top of each other forming stunning seascapes and creating numerous swim-throughs, tunnels and caverns. Giant seafans grip to the edge of the boulders, feeding off the currents that swirl around the rocks. Soft corals grow around the boulders. Pelagic fish prefer the currents on the west coast dive sites. Manta Rays and Eagle rays are often seen as are Leopard sharks, black tip reef sharks and white tip reef sharks. The Similan Islands can be dived by day trip dive boat or liveaboard dive safari. The liveaboard trips are really the way to go. Day trips by speedboat are long days for a couple of dives and really don’t give you the time to appreciate the beauty of the area. A liveaboard trip gets you to all the best dive sites. There are boats departing on different schedules most days throughout the high season (late October to early May). A typical Similan liveaboard trip duration is 4 days and 4 nights and includes diving further north at Koh Bon, Koh Tachai and Richelieu Rock. Longer trips also dive at the Surin Islands national park, Burma’s Mergui archipelago or the southern Andaman sea sites of Hin Daeng, Hin Muang, Koh Haa and Phi Phi.